Instead of paying between $25 and $30 for a single Wi-Fi smart plug from top brands like Anker and TP-Link, why not try a new model and get a little more bang for your buck? 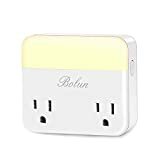 The BOLUN L WiFi Smart Plug and Night Light is exactly what it sounds like. It combines a dual-outlet smart plug compatible with Alexa and Google Assistant with a nightlight that automatically comes on in the dark and turns off in the light. Use the coupon code NPL03OFF at checkout and you can snag one for just $16.09.